Illustrations: 75 b&w photos, 35 tables, 14 maps. California is the nation's great vineyard, supplying grapes for most of the wine produced in the United States. The state is home to more than 700 wineries, and California's premier wines are recognized throughout the world. But until now there has been no comprehensive guide to California wine and winemaking. Charles L. Sullivan's A Companion to California Wine admirably fills that gap—here is the reference work for consumers, wine writers, producers, and scholars. Sullivan's encyclopedic handbook traces the Golden State's wine industry from its mission period and Gold Rush origins down to last year's planting and vintage statistics. All aspects of wine are included, and wine production from vine propagation to bottling is described in straightforward language. There are entries for some 750 wineries, both historical and contemporary; for more than 100 wine grape varieties, from Aleatico to Zinfandel; and for wine types from claret to vermouth—all given in a historical context. In the book's foreword the doyen of wine writers, Hugh Johnson, tells of his own forty-year appreciation of California wine and its history. "Charles Sullivan's Companion," he adds, "will provide the grist for debate, speculation, and reminiscence from now on. With admirable dispassion he sets before us just what has happened in the plot so far." 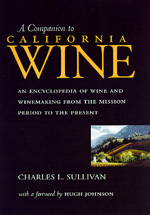 Charles L. Sullivan is the author of Like Modern Edens (1982), Wines and Winemakers of the Santa Cruz Mountains (1994), and Napa Wine (1994). He has written numerous articles for wine and food journals, including Wine Spectator, Wines & Vines, Vintage Magazine, and the Journal of the American Wine Society.